This fall, UCSC's Ph.D. program in Linguistics enters its 22nd year of education, research and scholarship. In celebration of that milestone, the department-along with the campus's Linguistics Research Center-will host the "UC Santa Cruz Linguistics Alumni Conference" on September 12-13. The core event of a week-long reunion for linguistics alumni in Santa Cruz, the conference will showcase the research of 18 graduates of the Ph.D. program-representing almost every graduating class since the program's inception in 1986. "It's a coming-of-age celebration," said professor Jim McCloskey, chair of UCSC's Linguistics Department. "And appropriately enough, it comes at a time when the department and the Linguistics Research Center are embarking on a new period of development, change, and growth." McCloskey noted that the department has hired three new faculty members in the past three years, marking a shift in how the department approaches the field of linguistics. "We're moving to a more experimental and laboratory-oriented way of working, as opposed to close one-on-one work with individual speakers," said McCloskey. But he added that professors at UCSC are still exploring questions raised by renowned linguist Noam Chomsky as to what extent language is hard-wired into our brains-and ultimately our genes. 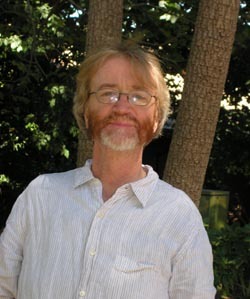 "We're asking the same questions, but using new techniques to answer them," McCloskey observed. "So it's not so much a profound intellectual shift, but more a big methodological shift." "The old ways of research look for repeating patterns in different languages and involve working closely with different speakers," McCloskey added. "The new methods focus on running carefully controlled experiments and testing hypotheses. We're just finding new, more rigorous ways to ask age-old questions." The UCSC doctoral program in Linguistics has the distinction of being one of the top-ranked programs in North America according to the National Research Council. Graduates of the program now hold tenured faculty positions in colleges and universities across the country, and in Europe and Japan, including the University of Chicago; UC Berkeley; the University of Massachusetts, Amherst; New York University; Swarthmore College; and USC. "We're very happy to welcome back to Santa Cruz an illustrious group of former students-now colleagues-who have made contributions in many areas of linguistics during the past 20 years," said McCloskey. "Part of the conference is looking back at what we've achieved and also looking forward. "It's like our 21st birthday party.a year late," he added.